You are here: Home / Desserts / Honey Apricot Pound Cakes & Honey Ridge Farms Giveaway! You know what I love about pound cake? It’s unpretentious. It’s simple. It’s easy to make and just as easy to eat. You can freeze it in individually wrapped slices and when at 1am you have a craving for something sweet, just throw that bad boy int he microwave for 30 seconds and you’ve got yourself a treat. You can flavor it with almost anything that your little heart desires. Or you can make it plain and slather it, drizzle it, brush it, layer it. Make Ice Cream Pound Cake Sandwiches or a Berry Pound Cake Trifle. You get my drift right? I love pound cake in more ways than one. Thus, when I received an assortment of Honey Ridge Farms Honey Cremes, I knew I’d make pound cake. Using the Apricot Honey Creme and a starting recipe from Camilla Salisbury’s book, Piece of Cake, these gorgeous Honey Apricot Pound Cakes came to life. The Apricot Honey Creme was sweet but with fruit undertones of the apricot, which made it unlike any other honey product I’ve ever tried. All natural ingredients such as USA Grade A clover honey and apricots, the cremes are never heated filtered, which makes sure you get all the health benefits inside! These pound cakes freeze beautifully, lending themselves to be a perfect dessert to bake a few of during rainy days and have them on hand for when guests pop in for a quick visit. You can also switch up the flours and use all purpose completely or whole wheat to 100%; switch the granulated sugar from brown sugar and add a touch of molasses for a deep and rich pound cake. My next test is making pound cake by substituting the butter with cold coconut oil for a Coconut Pound Cake for a tropical and summery twist! What kind of pound cake are you making at home this week? Preheat oven to 350F. In a medium bowl, mix all the dry ingredients. Reserve. Divide batter into two greased small loaf pans and bake until golden brown. Serve with a extra slathering of Honey Crème Apricot. Want to try Honey Ridge Farms Honey Cremes yourself!? Enter to win four (4) honey cremes, flavors are Apricot, Blackberry, Lemon and Raspberry packaged in a lovely box with bee trivia on the back! Visit the Honey Ridge Farms site and tell me which product you’d love to try! The comments are the official entry, there is no purchase necessary, void where prohibited. US mailing addresses only. One (1) winner will be chosen randomly. Prize will be shipped by Honey Ridge Farms. The contest ends Sunday, June 17th, 2012 at 11:59 pm Eastern time. The winner will be announced on Monday, June 18th, via email and will have 48 hours to respond before a new winner is chosen. Honey is a wonderful thing. And tasty to boot. I hope this enters me. Honey can even increases calcium absorption. It is helps the body in neutralising free radicals. It is good for body fitness. balsamic honey vinegar… if you looked in my pantry, you’d think I have a slight obsession with vinegars. this vinegar sounds delightful! I’d love to try their recipe for Blueberry Balsamic Bruschetta using their Balsamic Honey Vinegar…sounds amazing! Thanks! I would love to try the Balsamic Honey Vinegar! Oh I would so love to try these! Liking the Balsamic Honey Vinegar! Tweeted! Facebooked! Pinned!! The Ginger Lime Honey Glaze sounds amazing, as do the honey cremes! the Honey Crème Cranberry sounds especially good! yum! I would love to try the Sweet Chili Honey Glaze. I’m liking the Sweet Chili Honey Glaze… maybe even on some sweet pound cake! Yours looks awesome BTW. Also following on GFC – thanks so much! 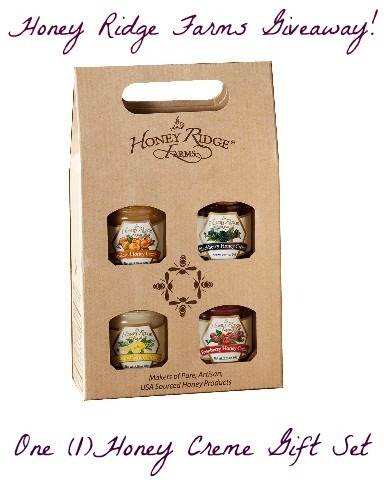 I follow Honey Ridge Farms on Twitter! MMmm… I’d love the honey balsamic vinegar. That sounds soooo good. I’d love the honey creme gift set 😉 But the Honey Crème Cranberry sounds especiallly good too! i’d love to try the balsamic honey vinegar! Following on Google Blogger – Thanks so much! Balsamic Honey Vinegar looks tasty! You know what I love about pound cake? Everything. Honey sounds great! Following on Blogger GFC Thanks so much as I love honey. The Wild Blackberry Honey looks yummy! I am following @HoneyRidgeFarms on Twitter. Toasted pound cake is amazing, too, by the way! I Follow Honey Ridge Farms on Twitter. Let me start off by saying that I love honey. The darker, more robust the flavor the better and an A+ if its unfiltered. I drizzle honey on my breakfast, lunch and sometimes my evening snack. If I had to pick one product from the site I would have to say the Wild Blackberry Honey. Great recipe, would love to top that with a raspberry compote. I recently tried the Honey Ridge Farms Honey Creme Apricot and it was delicious!! I love pound cake too – first time I ever made one was for my final in Baking 1 – I’d missed class the day we made them and so wasn’t quite sure I was doing it right for the final. The kicker? The chef cut mine, held it up and said – “this is a perfect example of pound cake”! LOL!!! Will you please, please, please come to my house and be my baker? Poundcake is one of my favorite “dessert items”. Good by itself, good with other yummy items. I’m a huge sucker for pound cake so this recipe is just screaming my name! And the apricot along with that honey is just killing me here! As for the giveaway question, I would love to try the Serrano Chile Balsamic Honey Vinegar. I’m so intrigued about the addition of the serrano chile here. I am Intrigued by the honey cremes! And I can attest to the fact that solid coconut oil is a good sub for butter in pound cakes. It just won’t rise quite as high. But that subtle coconuty goodness is more that worth it. A trade off I don’t mind making at all! What a beautiful pound cake. They look delicious! I’ll try it with ordinary Australian honey and maybe it will come out sort of okay. I’m thinking a slice of this with some strawberries soaked in cointreau. Honey Cremed Spiced looks like something interesting to try. Strawberry Vanilla Bean Crepes & Nuwave giveaway!